The Boeing 777 could have been reprogrammed from the ground, according to whispers overheard on military channels, increasing speculation that the missing aircraft was taken for a future terrorist mission. Chatter in security circles is focused on the role of the autopilot controls in the diversion of the aircraft from its original flight plan. Evidence that the aircraft could have been controlled remotely are self-evident. The United States has deployed drone aircraft all over the world to perform both surveillance and fire missions controlled by pilots half a world away from the targets being surveilled and attacked by their drones.Drones are designed from the ground up to be controlled remotely and so, it turns out, is the Boeing 777, which is equipped with an emergency intervention system that would allow a remote operator to land the aircraft from the ground simply by manipulating the autopilot. This has never been done, according to aviation experts, but it is within the realm of possibility. According to the information that was initially released by investigators, Flight 370 climbed to 45,000 feet and stayed there briefly before descending to 25,000 feet. The service ceiling for this aircraft is 43,100 feet. One of the theories about the odd behavior of the aircraft was that someone climbed to 45,000 to trigger cabin decompression and render the passengers of the aircraft unconscious…or dead. The problem with that theory is that the cockpit does not have a separate air flow system from the rest of the aircraft so that rendering the passengers and crew unconscious would also render the pilots unconscious as well. The fact that the aircraft then descended to 25,000 seemed to indicate that there was someone on board who was still in control of the aircraft, but that may not be the case if the aircraft was being controlled remotely. The technology clearly exists to permit someone to fly the Boeing remotely. The key question, which engineers are now researching, is whether it might be possible for someone on the ground to gain control of the aircraft through one of the 14 sensor contact points on the aircraft to reprogram the autopilot. Some security analysts are shocked that this possibility has never been considered before in security assessments after 9/11. In particular, security analysts are dismayed that, even after the 9/11 hijackers turned off the transponders to prevent air traffic controllers from identifying the erratic behavior of the aircraft, no steps were taken to make it impossible for anyone on board to turn the transponders off. That remains the case today. Much of the speculation about the present whereabouts of the aircraft is focused on the empty reaches of the Indian Ocean, based upon indications that the aircraft turned in that direction, where there are very few places for a 777 to land. There have been reports that the pilot, Capt. Zaharie Ahmad Shah, researched remote landing fields capable of handling a Boeing 777 and had a list of six remote airfields where Fight 370 could have landed. Experts identified more than 600 potential landing fields within the aircraft’s range. To build a runway for this aircraft, all it takes is a mile long strip of land. Level off 4,000 feet of that strip with a bulldozer, and put down some gravel. That is all it takes. Officially, Boeing states that the 777-200ER needs 11,100 feet to take off, but Boeing does not stipulate the minimum landing distance, for legal reasons. (If Boeing stipulates a minimum landing distance and someone crashes attempting to land in that distance, lawsuits will ensue.) An unsigned report in FlightGlobal.com on a test flight of a Boeing 777-300ER, which is a bigger, heavier aircraft than Flight 370, took off in 3,280 feet. Most people are not aware of this, but the Eisenhower Interstate Highway System, used by hundreds of millions of Americans every day, was specifically designed to provide two-mile long straightaways where heavy military aircraft could land upon returning from strike missions over the U.S.S.R. The rationale for this was that military planners feared that U.S. landing fields would have been destroyed by Russian counter strikes, leaving American B-52 bombers nowhere else to land. No B-52 bomber has ever landed on an Interstate, but quite a few civilian aircraft have. What this makes clear is that there would have been no problems landing the aircraft or taking off again, even from a short airfield. The problem is to find a place to land the aircraft where the local authorities would not arrest the pilot once the plane was on the ground. This scenario may seem far-fetched, but it is now being discussed on CNN, MSNBC and Fox. Planes like the Boeing 777 are equipped with two-way radio devices connecting the aircraft to various resources on the ground. 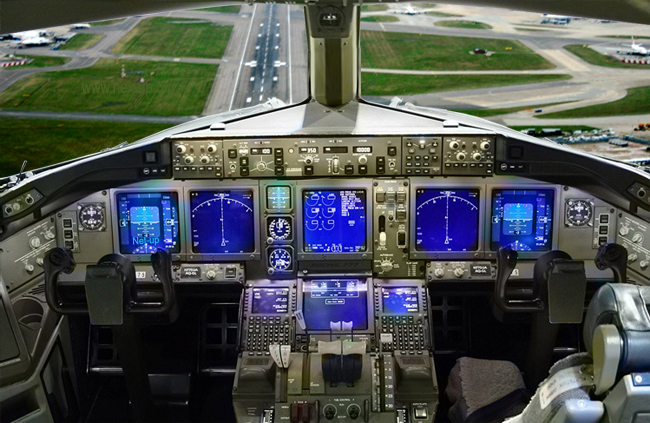 These devices are wired into the same systems that the autopilot is wired into because some of them report on the status of the autopilot system. One source claims that you can actually “call” this aircraft with a cell phone and exchange information with the on-board computer systems. These systems are used to conduct remote diagnostics and update the software on the airplane. At this point, as brutal as it sounds, investigators want to find the wreckage of a crashed aircraft because, if they don’t, there is increasing concern that the plane may show up again someday as a guided missile. If this Boeing 777 could have been reprogrammed from the ground, any other “fly-by-wire” aircraft could also be reprogrammed and flown from wherever the remote hijackers happened to be. If that proves true, then there are more important things to worry about than the whereabouts of Flight 370. 11 Responses to "Boeing 777 Could Have Been Reprogrammed From the Ground"